How is this package 320 MB larger than non-dev version? Then tells me to check my connection settings. No connection issues with the stable release. Hi @gaelic, thx to answer me! Here is the output when i try to run mendeley from terminal. Can you please try to start mendeleydesktop from a terminal to see what is happening and post the output here (or in the forums)? I have install all 4 dependencies, but still not working. 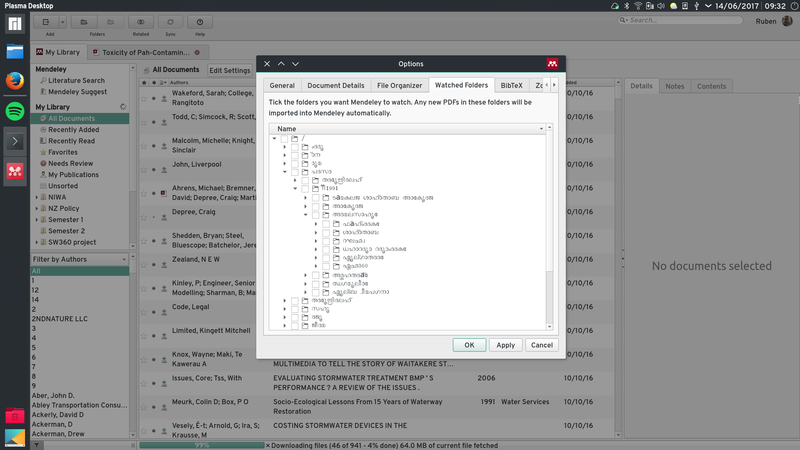 Mendeley install, but when i try to open its simply doesn't. This resolved the issue, thank you. Hi, thanks for the feedback. Worked fine for me on HiDPI without changes. This only shows up in 'watched folders'. Which font could it be? Stripping the bundled Qt libs still results in unreadable PDFs on HiDPI systems.